Not everyone enjoys going to the dentist. In fact, dental fear (or dental anxiety) is a very real condition that affects adults as well as children. 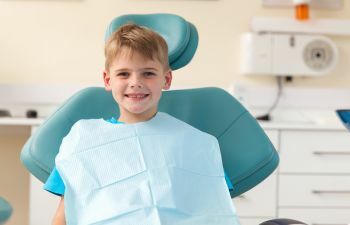 While it may be common to have to bribe or coerce your child into the dental office, if your child’s anxiety over the dentist is a problem or is keeping them from necessary dental care, you should seek a solution. Sedation dentistry is designed to help patients overcome fear and anxiety while receiving dental treatments. Sedation dentistry is not just for adults – there are safe options of sedation for kids too! In addition to the above mentioned reasons for getting sedation dentistry as a kid, it may also be a dental fear that was passed down from dad. That’s right; research studies have confirmed that there is an association between dental fear (or anxiety) in a father and his child. So if you are a parent who is scared of going to the dentist, be careful about passing this trait down to your kids! There are a few different types of sedation dentistry for children. At our Milton office, we offer oral sedation using a special syrup. The medication lasts up to an hour and allows your child to fully relax while dental treatments are performed. Sedation dentistry does not “put your child to sleep” in the same way anesthesia does. It merely allows them to let go of their anxieties and sit calmly for the dentist. Many kids don’t even remember the procedure being done! If you believe your child’s fear of the dentist is more than what is normal for a kid their age, please discuss your concerns with us. We can provide oral sedation during routine cleanings as well as more complex procedures. The important thing is to give your child a comfortable and rewarding experience at the dental office.